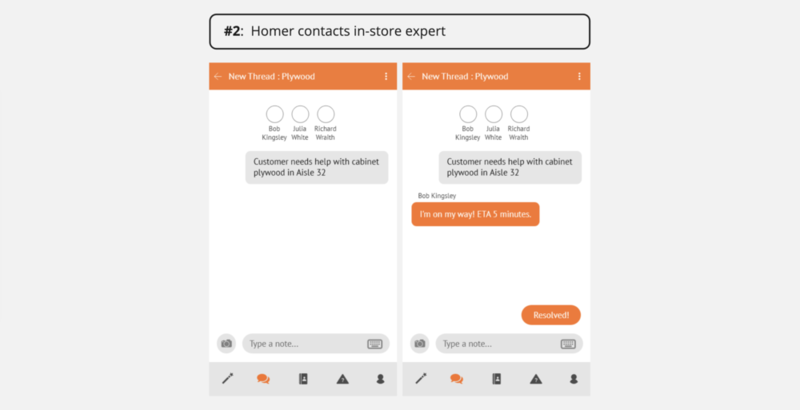 Connecting Home Depot sales associates with expert assistance through voice user interface. 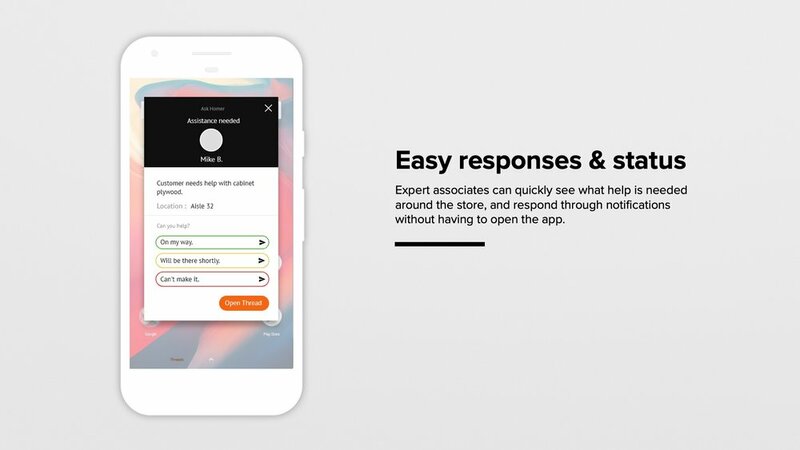 Our challenge was to Identify an opportunity to improve the effectiveness of Home Depot sales associates in terms of their ability to accomplish essential tasks without compromising customer experience. Our target users: Home Depot associates of varying levels of expertise who juggle customer care and bay/inventory upkeep on a daily basis. Client-Facing Communication: represented the team’s research findings and designs through considerate slide deck design and oral presentations. Coordinated with industry partners to define success parameters, schedule weekly meetings, and share resources. 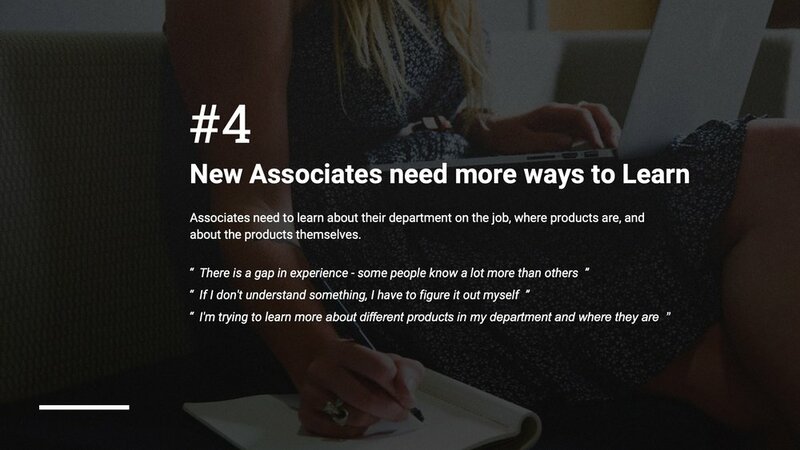 After each user research session , the team would gather for debriefing sessions were insights were discussed and compared from two or more person’s perspectives to ensure accuracy. Processing large amounts of diverse qualitative data required a strategic approach to systematically recording, tagging, grouping, and presenting findings to clients. Notes and audio recordings gathered during user research were transcribed systematically within an affinity map for the purpose of finding painpoints related to tasking. 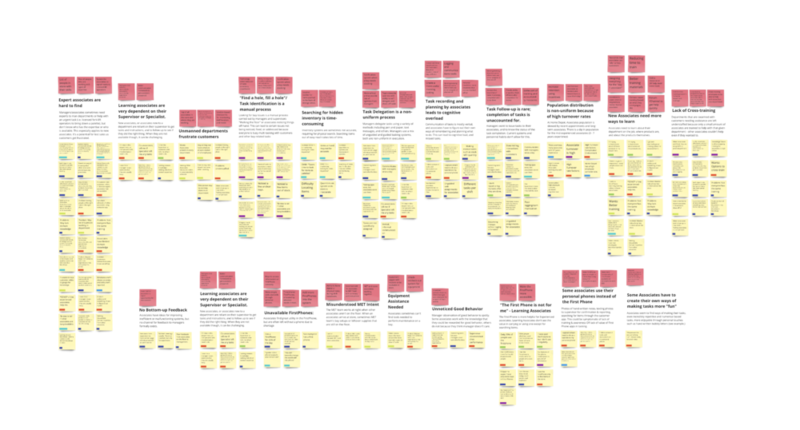 Over 450 individual insights (yellow) recorded and synthesized into 19 unique painpoints (red). This large document was then formatted into an easily browsable PDF for our clients. The team discussed the potential value of each pain-point in terms of quantity of supporting research, relevance to client needs, and respect for the ecosystem of Home Depots products. 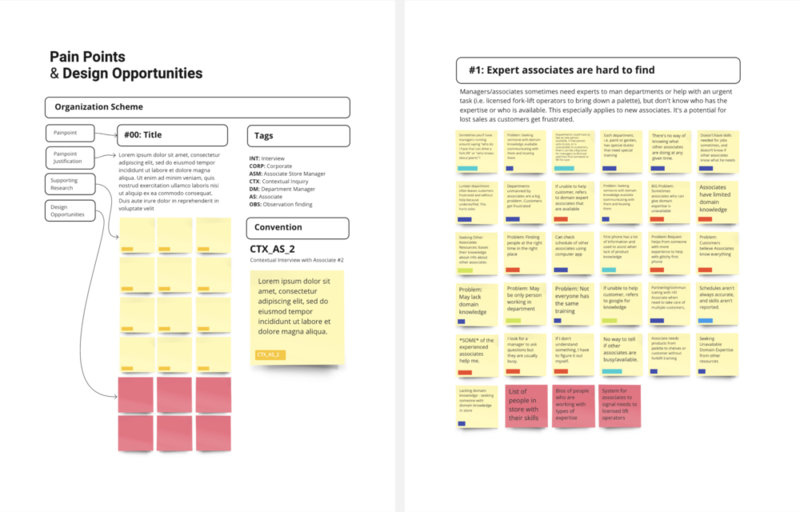 above: five painpoints with the most evidence and potential client impact isolated for the next phase of design. 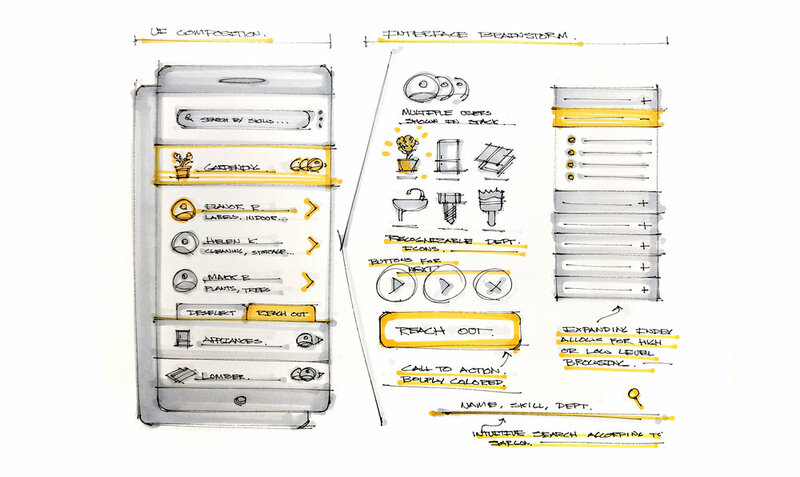 With evidence-based user scenarios and a system flow in hand, the team began sketching wireframes and app features. I led this phase of sketching, directing the team’s efforts towards an appropriate level of detail and consideration of composition. 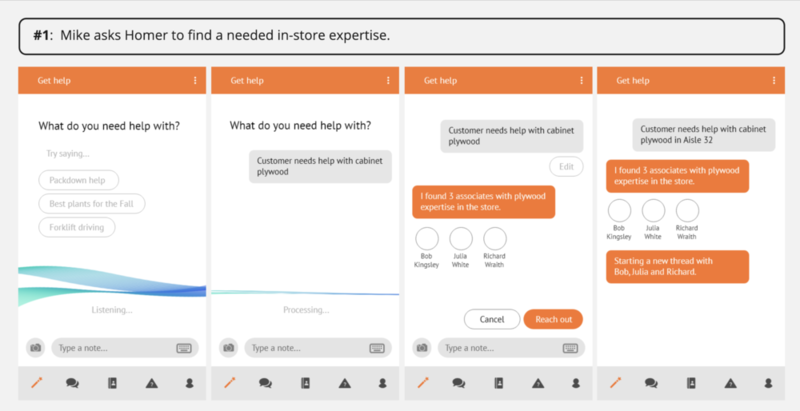 Since Home Depot associates use smart-phones issued by the store that run on android, interface development was guided towards Google’s Material Design for its intuitive mental models and well-built visual design systems. 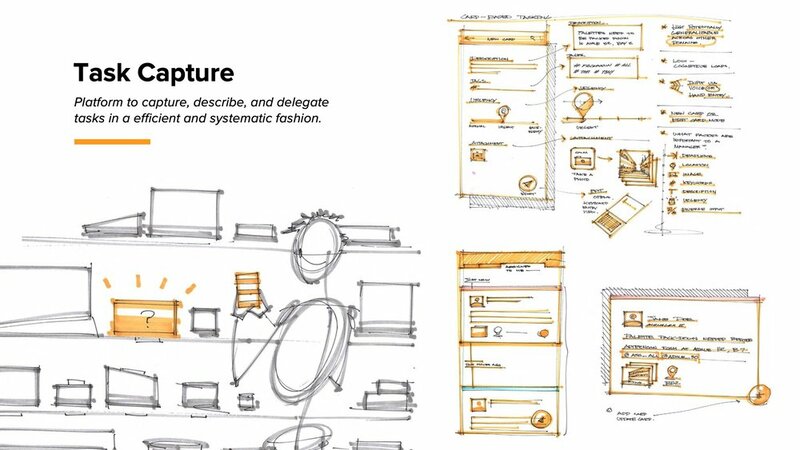 Iterating on the previous wireframe sketches, initial user experience flows were created using Adobe XD for its rapid mockup and interaction capabilities. Effort was focused on “mini-flows”, or quick tasks within the grander scheme of accomplishing a goal. The team met to discuss these small batches of UX on a daily basis, which led to valuable comments on specific interface improvements. Above, a “mini-flow” of Mike’s story where he initializes an inquiry through a voice interaction. 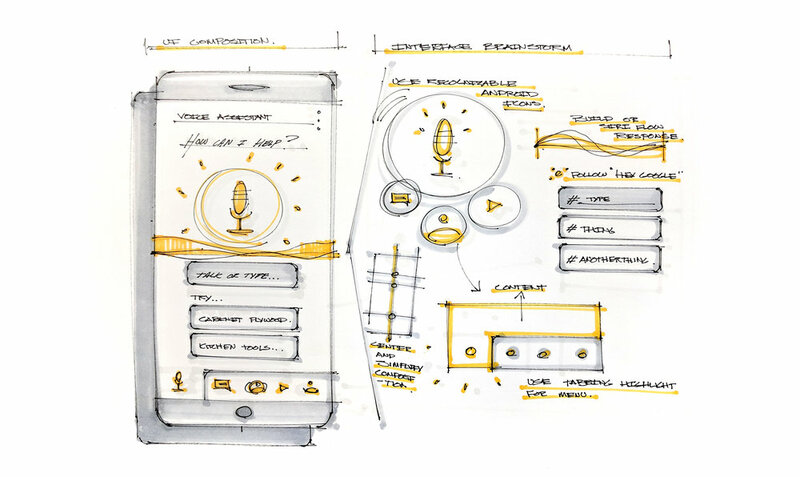 Once UX flows for both use cases were created, the team conducted a focused critique on any obvious or blatant interface missteps in terms of usability, language, and conformity to current mental models of messaging and voice assisted interfaces. The entire UX flow was overhauled according to the feedback, and designed with XD with functioning simulations of voice interaction. Above: final UX flow, system features, and a video demoing the voice interaction. Early analysis of the SUS Usability Evaluation ( below ) revealed an overall average of 84.6. Based on SUS standards, a score above 68 is considered above average in terms of usability factors. While these results are optimistic, another test of the same nature is needed with more participants. During the testing, a non-negligible amount “nudging” came from myself and the other facilitator, which may have biased the results.